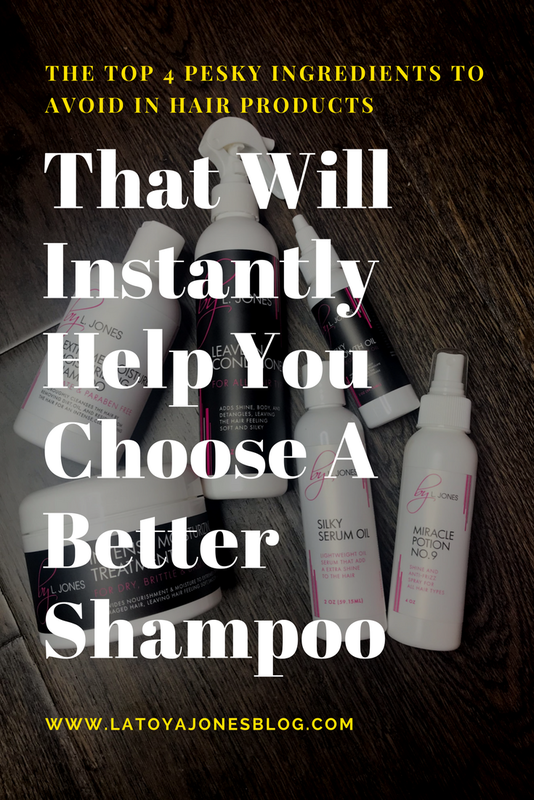 When it comes to shampoos, most people recognize brand names, but do not recognize which ingredients they should avoid. Before I even thought about creating my hair care company, actually turning the bottle around and reading the ingredients listed was the last thing on my mind. I simply went by what I heard worked well for someone else. However, after I created by L. Jones, whenever I am shopping for products reading the label is now the first thing I do. Different types of shampoos contain different ingredients, but some ingredients are more commonly found than others. Whenever water is the first ingredient in shampoos and conditioners, it is always a good sign. Manufacturers list the ingredients in an order based on what it contains the most of to what it contains the least of. Water is the best hydrating agent, so whenever it is listed first is fantastic. Some shampoos also contain harsher ingredients, which are not great for the hair. Listed below are four ingredients to avoid in your shampoo. Sodium Lauryl Sulfate/Sodium Laureth Sulfate- This ingredient is mainly used in shampoos because it lathers really well and does have good cleansing properties. However, this ingredient is synthetic and can cause tangled hair, scalp irritation, and eye irritation. It is also used in engine degreasers, garage floor cleaners, and car washes. Although it has been considered to have concentrations that are safe in cosmetic products, studies show increased concentrations increase the risk of irritation and they strip the hair of its natural oils. They are not considered carcinogenic, but when choosing a shampoo, try to avoid one with sulfates in them. Parabens (ethyl, methyl, propyl, and butyl)- These preservatives are used to extend the shelf life of products and to inhibit microbial growth. They have also been known to disrupt normal hormone function. Due to being found in breast cancer tumors, this ingredient is becoming highly controversial. Parabens also mimic estrogen, which is said to cause some girls to start puberty early. I would advise to stay away from shampoos with parabens in them. Synthetic Colors and Dyes- These are used to make the item look better but are made from coal tar that contains heavy metal salts that can cause irritation. They are also know to be carcinogenic. Triethanolomine (TEA) & Diethanalomine (DEA)- These ingredients are also know to lather up well but since they are highly acidic, they can cause allergic reactions and can also cause the hair to look dry. My thoughts: Opt for shampoos with more natural ingredients in them than the ones listed above. When I created by L. Jones, I knew that I would not include any of the above listed ingredients. All of my products are sulfate and paraben free and contain no synthetics, dyes, or anything of the like. If you are someone who has hair that is prone to dryness, you definitely want to stay away from any of the listed ingredients because they will only dry your hair out. But the only way to know what a product has in it is if you actually turn it around and read the label. So the next time you are out picking up more hair products read the label carefully so that you can make a more informed choice.